Ralph B. Thompson was born in Thompson Woods and grew up in one of two houses (now depressions in the ground) located along the path just west of the south end of the SIUC Student Center. He is a descendent of a prominent Carbondale founding family. His grandfather, Col. Joshua Thompson came to the area in 1852 and settled in Union County. His father, Theodore W. Thompson, moved to the outskirts of Carbondale in 1887 in the area now known as Thompson Woods. Ralph Thompson attended Southern Illinois Normal University and earned his B.Ed. degree in Chemistry in 1934. His A.M. and Ph.D. degrees were earned at Harvard University in 1936 and 1938 under the direction of the well known educator/scientist, James Conant. 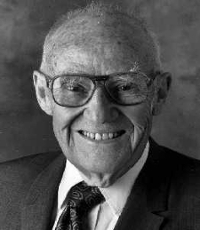 Dr. Thompson was very successful in the field of industrial chemistry, holding 140 patents. He spent over 20 years with Universal Oil Products, where he worked in the petroleum industry, and when he retired, he was Manager of Division Research of Nalco Chemical Company, where he worked in the area of water treatment. He received the SIU Alumni Achievement Award for Professional Achievement in 1963 and twice was the guest of honor of the Latin American Chemical Congress.